A woman was arrested after she attacked another woman with a tire iron after a dispute over a parking spot at a Wawa in Delaware County last week. It happened on March 10th at the convenience store on the on the 400 block of 69th street in Upper Darby. 51-year-old Aretha Robinson was arrested and charged with assault and making terroristic threats. Robinson and the 41-year-old female victim had an argument in the parking lot over a space. Robison following the woman into the store and struck her with a tire iron. 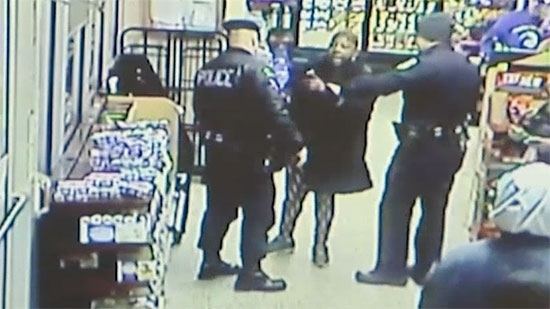 Police arrested her in the store and disarmed her of the weapon. She is being held on $15,000 bond. The victim suffered a contusion and refused medical treatment. Hundreds of kilos of cocaine were found on a container ship at the Port of Philadelphia during a drug bust on Tuesday morning, 3/19. Multiple agencies were involved including Philadelphia Police, Pennsylvania State Police, Delaware State Police, Homeland Security, the DEA, and the U.S. Coast Guard and Customs and Border Protection. While inspecting the MSC Desiree around 10:30 a.m., authorities discovered at least 537 kilograms of cocaine with a street value of $18 million. The boat was traveling from Columbia to Europe. Philadelphia Police are investigating after dozens of tires were slashed in West Philadelphia early Tuesday morning. It happened around 1 a.m. over seven blocks of Media Street between 51st and 61st Streets. Multiple suspects were caught on surveillance video walking along the street and slashing tires as they went. Police confirmed that 47 cars had at least one damaged tire, but as many as 70 could have been struck.